Note: This is the bound book only and does not include access to the Enhanced Pearson eText. To order the Enhanced Pearson eText packaged with a bound book, use ISBN 0134403193. What it means to be an early childhood professional in today’s world–from renowned author and educator, George S. Morrison. 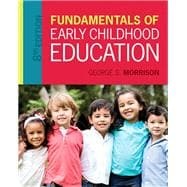 This brief, reader-friendly look at the field of early childhood education has become a best-selling classic, appreciated for its practical, applied approach and its engaging chapter features that look at every aspect of the field of early childhood education–early childhood programs, professionals in practice, diversity strategies, technology issues, and ethical decision making. Young children’s unique developmental and education needs are covered from birth through age eight in separate chapters on infants and toddlers, preschoolers, kindergartners, and the primary grades. The book’s emphasis on professionalism throughout keeps the focus on meeting the needs of each and every child and providing up-to-date information and strategies to develop competent, informed early childhood professionals. Thoroughly revised and updated throughout, this edition offers a contemporary, accessible, user-friendly approach to all of the major topics, programs, and issues at the forefront of the field today. The Enhanced Pearson eText features embedded videos and assessments. George S. Morrison is professor of early childhood education at the University of North Texas, where he teaches courses on early childhood education and development to undergraduates and mentors masters and doctoral students. He is an experienced teacher and principal in the public schools. Professor Morrison’s accomplishments include a Distinguished Academic Service Award from the Pennsylvania Department of Education, Outstanding Service and Teaching Awards from Florida International University, and the College of Education Faculty Teaching Excellence Award at the University of North Texas. His books include Early Childhood Education Today, Thirteenth Edition and Teaching in America, Fifth Edition. Professor Morrison has also written books about the education and development of infants, toddlers, and preschoolers; child development; the contemporary curriculum; and parent, family, and community involvement. Dr. Morrison is a popular author, speaker, and presenter. His research and presentations focus on the globalization of early childhood education, the influence of contemporary educational reforms on early education and teacher education, the integration of technology in instructional practice, and the efficacy of large class instruction in the preparation of preservice teachers. Professor Morrison also lectures and gives keynote addresses on early childhood education and development in Thailand, Taiwan, China, South Korea, and the Philippines. Elizabeth Beavers (Chapters 1, 6, 9, and 10). Dr. Elizabeth Beavers has over 25 years of experience teaching and working with public school systems, preschools, and Head Starts in the fields of early childhood and early childhood special education. Elizabeth has experience as a classroom teacher, a program coordinator, a consultant for school districts, a trainer, and teacher educator. She is presently an assistant professor at the University of Houston-Clear Lake. Elizabeth earned her B.S. in psychology, M.S. in Special Education, and Ph.D. in Curriculum and Instruction (emphasis on Early Childhood and Elementary Education). Her areas of expertise include teacher education (critical thinking and reflective practices), the emotional dimensions of teaching and learning, developmental disabilities, and instructional and intervention pedagogy. Elizabeth has presented at multiple local, state, national, and international conferences and has published in early childhood education journals. Elizabeth is an active member of national and local organizations including serving as President of the Texas Division of Early Childhood; President of Gulf Coast AEYC; Outreach Chair for Texas AEYC; and Membership Council for Council for Exceptional Children’s Division of Early Childhood. Elizabeth also serves on several early childhood advisory boards. Donna Kirkwood (Chapters 3, 7, 12, and 13). Dr. Donna Kirkwood has been working with children since she was in high school. She has been a nanny, a teacher’s aide, a teacher, a program coordinator, a director of an NAEYC accredited program and a college professor. She has done training across the state of Texas and at various local, state and national conferences. Donna has a Ph.D. in Child Development from Texas Woman’s University. She has been an Assistant Professor and Adjunct Professor of Early Childhood Education and Child Development at several colleges and universities in Texas. Currently, Donna is the National Program Director for HIPPY USA. Mary Jean Woika (Chapters 2, 5, 8, and 11). Mary Jean Woika, M.Ed. has worked in early childhood education and early childhood special education for over 30 years. She is currently an assistant professor and program manager at Broward College in Early Childhood and K-12 Education. She teaches courses in Math and Science for Young Children, Creativity, Language Arts and Literature, Diversity and Exceptionalities in Education, Child Guidance, and Management of Early Childhood Centers. In addition to teaching, her responsibilities at the college include mentoring practicum students in their early childhood classrooms throughout Broward County, and providing oversight to the North Campus Lab School, where Broward College students from multiple disciplines interact and learn about the development of young children, best practices in early childhood education, and the management of early childhood centers. Ms. Woika has co-authored a textbook and trainee’s manual, All About Child Care and Early Education, which was developed to be used in the training of CDA students. Before coming to Broward College Ms. Woika was a child care director, an early interventionist, an early childhood special education teacher, a behavior consultant, and inclusion specialist in an outreach program. She has taught college courses in Pennsylvania, Colorado, Massachusetts, and in Florida In face-to-face, blended, and online formats. Ms. Woika has sat on several state and county committees where she assisted in the curriculum selection process and the development of the QRIS program in Broward County. Currently she sits on the Conference and Professional Development Committees for the Early Learning Coalition of Broward County.